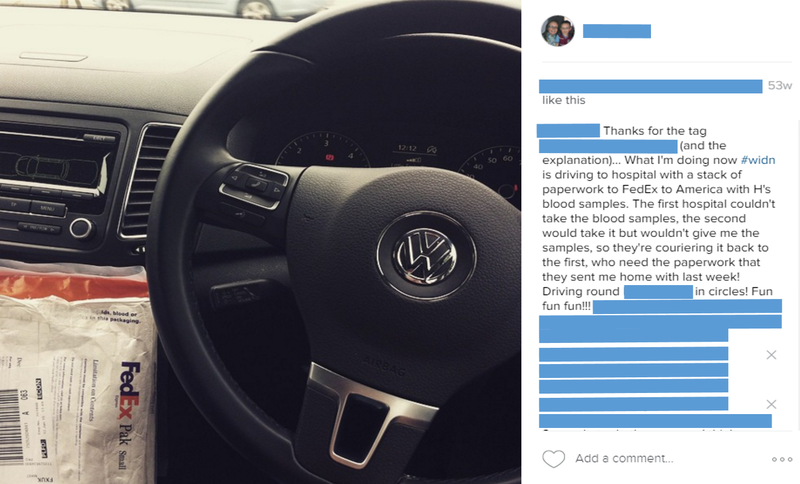 This time last year I was driving around the city trying to Fed-Ex blood samples to America. We’d had a bit of a palaver trying to get the blood – the hospital experienced at getting blood from tiny veins wasn’t the same hospital that issued the blood forms and requested the bloods. When the second hospital finally agreed to take the bloods though they wouldn’t let me leave with them explaining they had to be processed in their own lab. 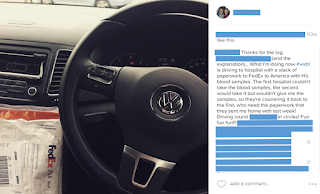 The thing is, if they’d been able to do the specific genome sequencing that these bloods were destined for, then we wouldn’t be in the position of having to courier blood to America in the first place. It took a lot of phone calls and reasoning and patience to finally get them to agree to courier the bloods back to the initial hospital. However, the blood needed to be sent with reams and reams of paperwork and forms. Where were the forms? In my car!!! So I had to drive to the first hospital with the forms to meet the blood there, reunite them with the paperwork before they could finally wing their way to America. If you’re wondering – the process of getting the blood was also hideously stressful and involved me and a nurse pining Hugh down whilst he screamed and I desperately sang ‘row, row, row your boat’ whilst a nurse dug around in his teeny veins desperately trying to extract 7 millilitres. He was bruised and angry, I was sweaty and exhausted and I’m sure the nurses were glad to finally see the back of us after the horrendously long and complicated ordeal! Why am I mentioning this whole ridiculous circus? Well, it’s Undiagnosed Children’s day on 29th April and SWANUK, a project which supports families of children living with undiagnosed conditions, have asked us parents and carers to help raise awareness by looking back to where we were this time last year and what our hopes are for the future. Well, this time last year, despite the ordeal of getting the blood to America, I was exceptionally hopeful that we might finally be able to find an answer as to why Hugh has so many challenges. We’d been enrolled on a research study over there which sequenced DNA at various breakpoints on the chromosomes with the aim of identifying the specific missing or broken gene or genetic abnormality that had caused Hugh’s issues. They were fairly confident they’d find the answer within six months. Hugh’s on a research study here in the UK too and last March our geneticist had told me we could expect an answer within the year. I naturally assumed that by now we’d know for sure – that we’d have a sequence of little letters and numbers which, although meaningless to many, would explain exactly what had happened when Hugh was just a growing and developing collection of cells in my womb, to cause such profound learning difficulties and complex health needs. Yet a year later, we are still none the wiser. Despite many of my friends getting results through the DDD study (Deciphering Developmental Disorders) we have heard nothing. And the DGAP study(Developmental Genome Anatomy Project) have hit a stumbling block – what they’ve discovered is not what they had expected to find and it doesn’t quite make sense, so they need to do more research to see what this means for us. I am not naïve enough to think that knowing the cause of Hugh’s problems would lead us to a cure. I know that Hugh is Hugh and no diagnosis will change that. I had hoped to know for certain that it wasn’t an inherited condition that could be passed on to future generations, whether that be children of my own, grand children or nieces and nephews. Without a diagnosis, that is still uncertain. I had also hoped that we might find someone, somewhere with a similar genetic abnormality that could give us an insight into, but particularly hope for, the future. Whilst I admit that I am disheartened to still not have our ‘answer’, I am still filled with hope for the future. Not specifically for Hugh’s future, but for the future of undiagnosed children, as things are really changing and gathering momentum. 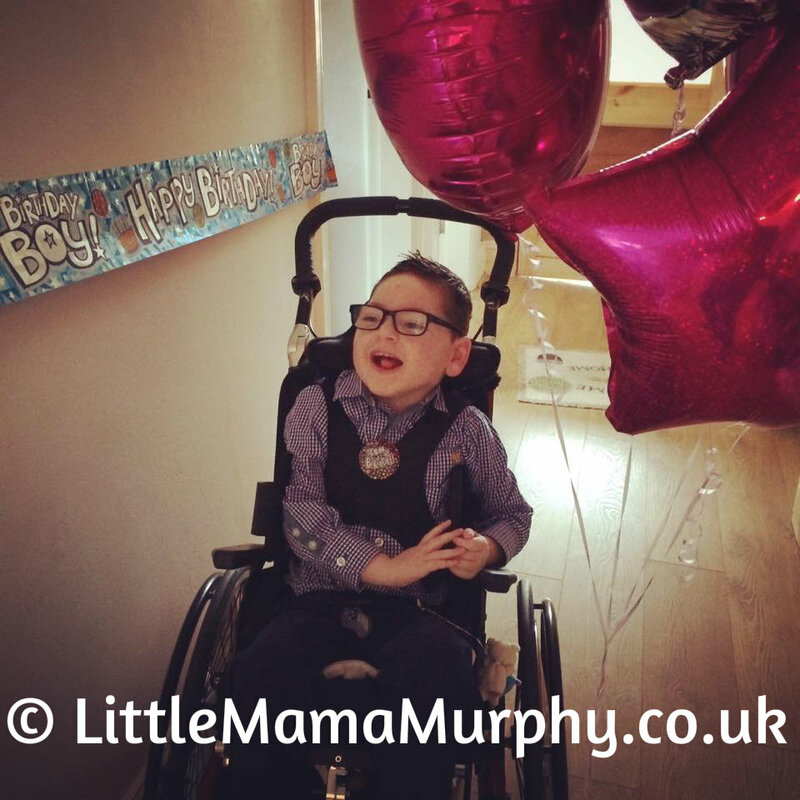 When Hugh was born in 2010 I didn’t know ‘undiagnosed’ was a real thing – I genuinely thought we were the only people in the world in that position. A year later Genetic Alliance took over the SWAN UK project (Syndrome Without a Name) and used Big Lottery funding to become the only specialist support available in the UK for families of children and young people with undiagnosed genetic conditions. Undiagnosed Children’s Day: A nationwide annual awareness day aimed at raising awareness of undiagnosed genetic conditions and funds for SWAN UK: – this year, our 4th Undiagnosed Children’s Day, is on Friday 29th April. Last year we raised £18,917! Can we make it more this year? AnAll Party Parliamentary Group on Rare, Genetic and Undiagnosed conditions – that is an informal, cross-party group of MPs and Peers interested in raising awareness in parliament of rare and undiagnosed conditions with the aim of ensuring patients and families have access to appropriate care and support. The World’s First Specialist Nurse for Undiagnosed Conditions – a post created with input from SWAN UK families and funded by Roald Dahl’s Marvellous Children’s Charity, this nurse is based at Great Ormond Street Hospital and will help co-ordinate care for children without a diagnosis. The UK’s First Rare Disease Centre at Birmingham Children’s Hospital – led by the formidable Larissa Kerecuk, a consultant paediatric nephrologist, Birmingham Children’s Hospital are currently in the process of creating the first holistic Paediatric Rare Disease Centre where multi-disciplinary and multi-speciality rare disease clinics will take place with coordination of care, peer support and better access to research, information and treatment. What this means is, that rather than traveling to numerous hospitals to see various consultants, children with undiagnosed and rare conditions will see all the specialists under one roof. 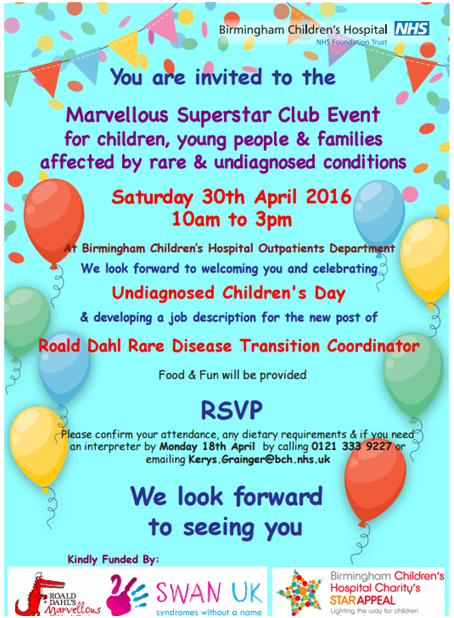 Two Rare Disease and Genetics Nurses – also funded by Roald Dahl’s Marvellous Children’s Charity, these two key nursing roles, based at Birmingham Children’s hospital and linked to the new rare disease centre, will be recruiting patients with undiagnosed conditions to the pioneering 100,000 Genomes Project, which is aiming to develop a new genomic medicine service in the NHS – transforming the way people are cared for. They will also offer vital support to families with conditions without a firm diagnosis and work on setting up the country’s first SWAN (Syndrome without a Name) clinics. 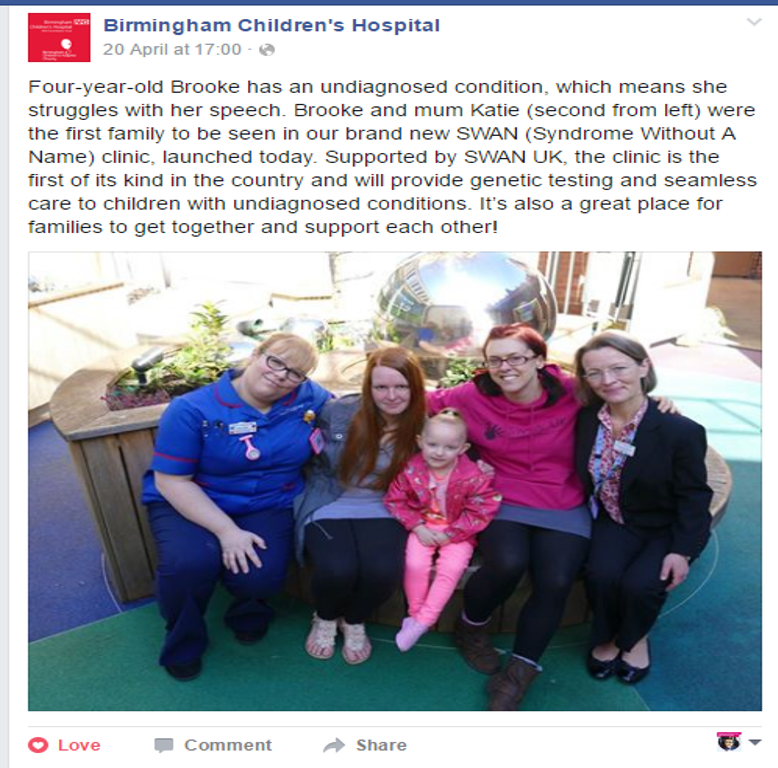 The first SWAN Clinic took place at Birmingham Children’s hospital on 20th April. This was the first of many SWAN clinics held at the hospital and will ensure that patients with undiagnosed conditions have access to the latest genetic research and a coordinated care plan. Eventually these will be carried out in the purpose built rare disease centre. 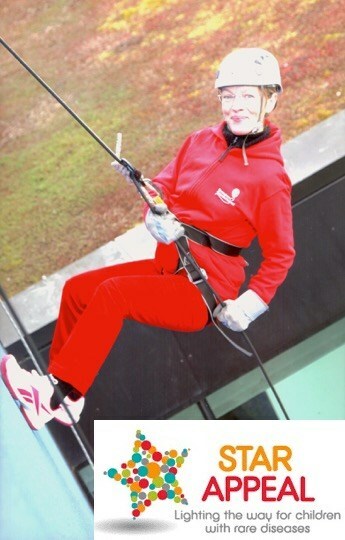 SWAN UK have a ‘Big Ambition’ – that every one of the 6000 children born each year with a Syndrome Without A Name have access to the support they need, when they need it. Just 6 years ago when Hugh was born SWAN UK didn’t exist. I didn’t know there was anyone else in the world searching for a diagnosis, like we were. I felt scared and alone. Now there is a vast network changing the future of care and support for those without a diagnosis; an army fighting to ensure that those 6000 children will have the support they deserve. SWAN UK is making big changes. 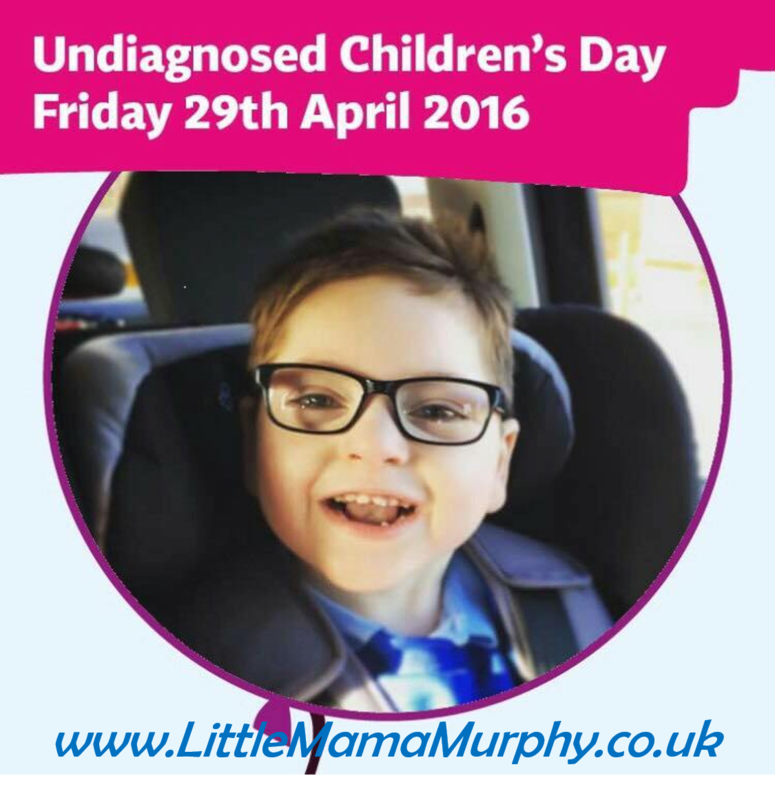 No undiagnosed child should have to fight for care like Hugh did. No family should feel isolated. There really are exciting times ahead. I'm sure I've missed lots too. Writing it down like this really made me appreciate how far things had come since Hugh was a baby.